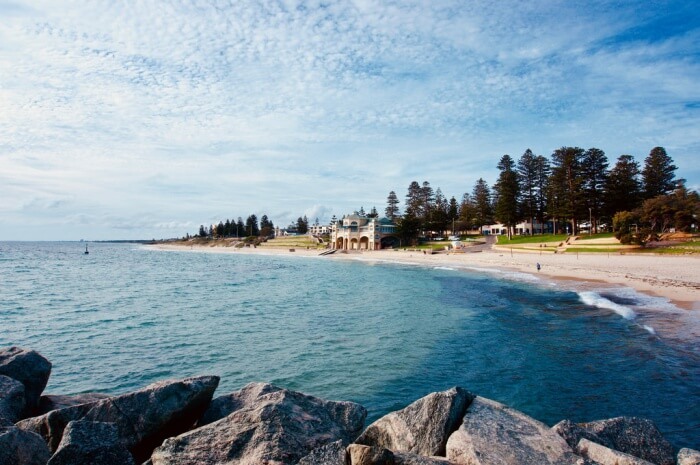 Cottesloe Beach is one of Perth’s most beautiful beaches that stretches over a 0.6 miles. Cottesloe is a shining beach with white sand and blue waters, making it one of Western Australia’s most popular beaches, especially for water sports like swimming, surfing and snorkelling. The locals have been heading to the beach for decades and spend most of the summer days at the beach, basking in the sun or participating in some water activities. 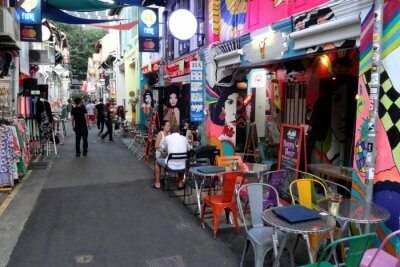 The beach is lined with some of the best cafes, restaurants and bars where you can head, after an enjoyable day at the beach. Very few people know that this beach in Western Australia was voted as the second best beach in the world for locals and tourists to spend their off days. Read on to find out more about this glistening beach and about everything you can do here. The best time to visit Cottesloe Beach is from the months of October to April. 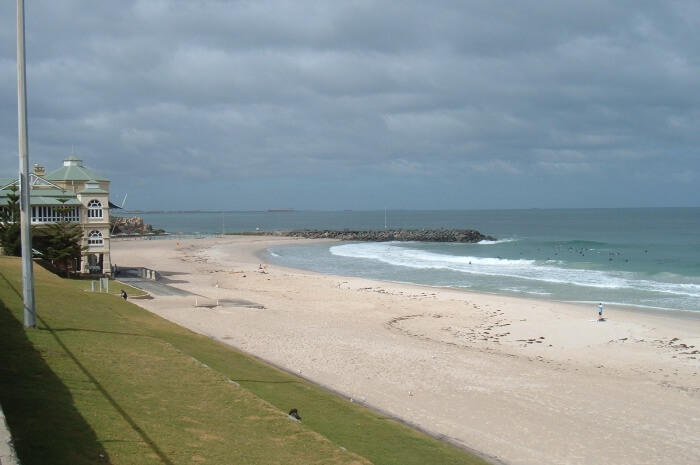 Usually, the Cottesloe beach weather is pleasant, with afternoons being relatively sunny but characterized by cold winds blowing across the beaches. 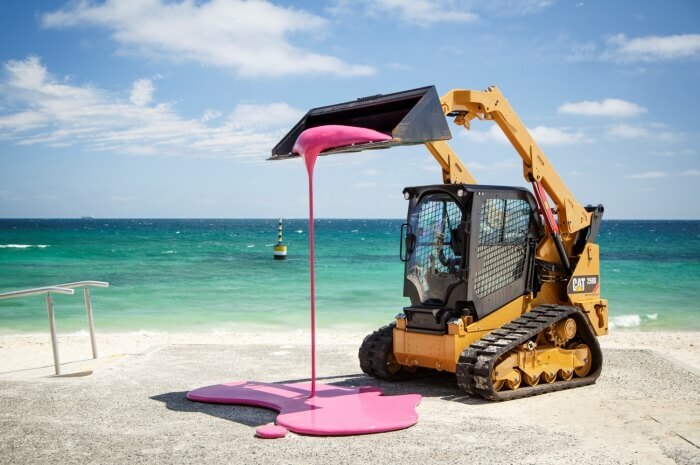 If you visit in March, you will also get a chance to witness the Sculpture by the Sea exhibition which transforms the beach into a super scenic art gallery. 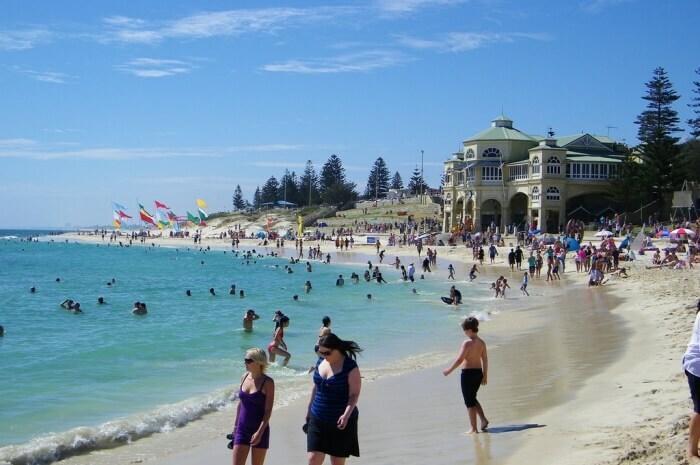 The Cottesloe beach came about when the early British settlers in Perth created the River Swan colony which then struck them with the idea of going to a ‘beach’ and experiencing the luxury of a seaside. 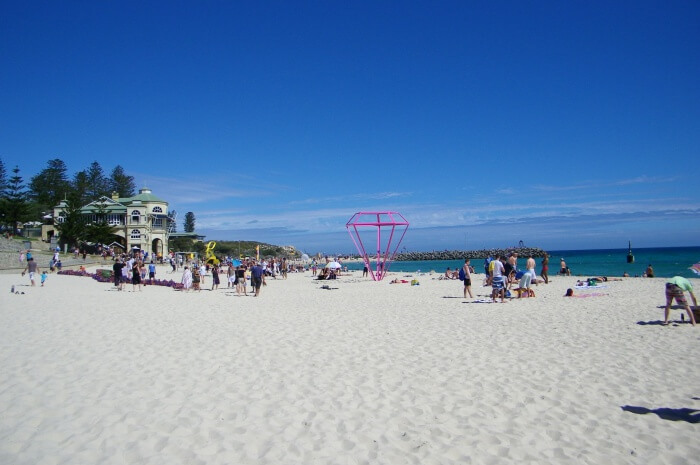 Cottesloe Beach is now one of the most popular beaches in Perth, Western Australia. The beach is popularly known as ‘Cott’ among the locals and is one of the most frequented spots, by locals as well as by tourists visiting Perth. When you visit the beach, you will see flocks of people playing on the beach, relaxing by the shore and some even taking a rejuvenating swim in the waters of the Indian Ocean. The glistening white sands of the beach and the clear waters make it stand out from the rest of the beaches in Western Australia, adding one more reason for the beach’s popularity. The beach is a superb place to catch up with friends and family, whether it’s a long walk, a run along the beach or some super drinks at the surrounding pubs. While there are so many things to choose from to experience around and at this beach, it is always better to know about the best few before visiting. Scroll down to know more. Originally, the exhibition was started in 1997 at Bondi Beach but was later shifted to Cottesloe Beach and has only been becoming better with every passing year. Sculpture by the Sea is nestled on the Cottesloe Beach itself and has displays lined up right from the sea wall, all the way to the sand, extending towards the North Cottesloe side. 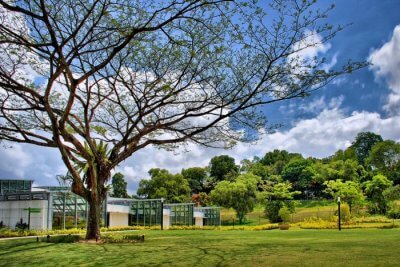 The exhibition is surrounded by lush grassed lands which add to the stunning exhibition’s beauty. 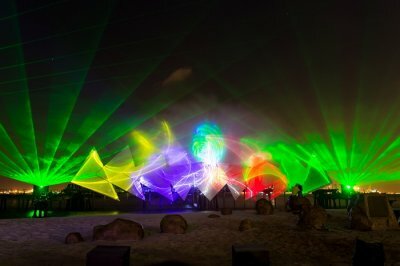 At this exhibition, you will get to see the most beautiful and creative installations that are created using some of the most unique materials. At Sculpture by the Sea, you can easily spend about an hour or two, just wandering about, looking at the imaginative sculptures laid across the beach. Location: 302/61 Marlborough St, Surry Hills NSW 2010, Australia. Cottesloe has some very picnic-friendly spots between the Indiana Teahouse and the rock groyne. You will find some super shady slopes that overlook the beach, making it just the right place to spread out your mat and have a nice picnic. The tall Norfolk Island pines shade you from the sun but also allow some sweet rays of sunshine to peep onto your little picnic. Make sure you go a little early during the day as the lorikeet roosts that come back to the pines make too much noise, making it difficult for you to enjoy your picnic. One of the best ways and not to mention, healthiest ways to explore a place, is to take a long stroll or a cycle down. 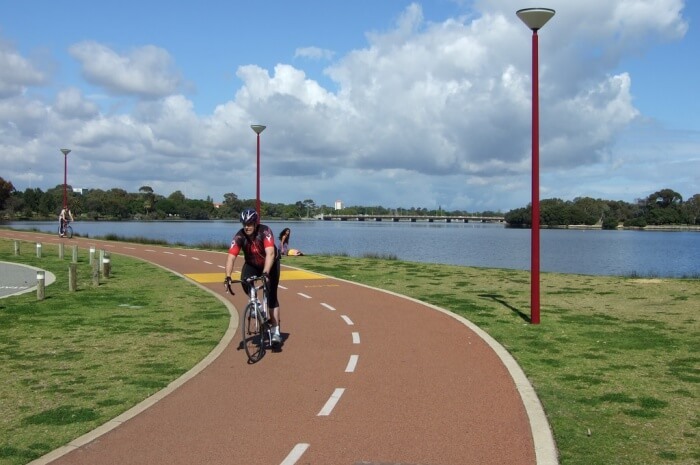 The track from Cottesloe to Hillary stretches to about 25 kilometres and gives tourists a chance to cycle through Perth’s scenic coastline. If you think 25 kilometres is too much, you can just choose any one section of the track and cycle it down. Swimming is always a good idea, especially when it is about swimming at the Cottesloe beach! The best areas to swim at Cottesloe is beneath the Surf Club and the Indiana Tea House. Being one of the most crowded areas of the beach, this section of the beach is the safest place to swim. If you are not a seasoned swimmer, we suggest you swim between the flags which are right in front of the designated lifesavers. You will also see a bell-like object parked offshore, which was intended to be a shark net but now, is used by swimmers to climb up and jump down, directly into the turquoise waters of the beach. Just be careful of slipping. At Cottesloe, irrespective of the time you go, you will see lots of people walking, cycling and running, giving the beach a very sporty feel. You can take a long stroll on the paved path from Swanbourne which stretches up to the Leighton Beach. The best part about walking down this path is the panoramic views of the beach that compliment your walk. 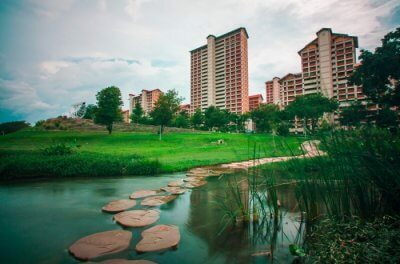 A walk down this paved track is one of the best things to do on a relaxed evening when you all you want is to spend some quality time with loved ones. 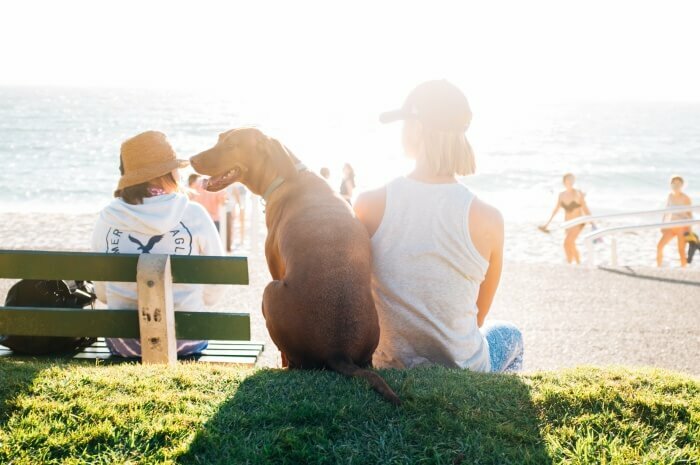 Cottesloe Sunday Sessions are very popular with the locals and is an event that you must experience at least once. This Sunday session is your place to go if you are looking at spending an afternoon in the company of new friends and with some drinks. Every Sunday afternoon, people gather either at the Cott Hotel or the Ocean Beach Hotel, both of which are located on Marine Parade, right across the beach. These Sunday Sessions start early and go on till about 10pm as the pubs in Perth, Australia shut down after this. If you still want to party, we suggest you head to Club Bayview in Claremont which spins some super rock music on Sundays as opposed to casual pub music. 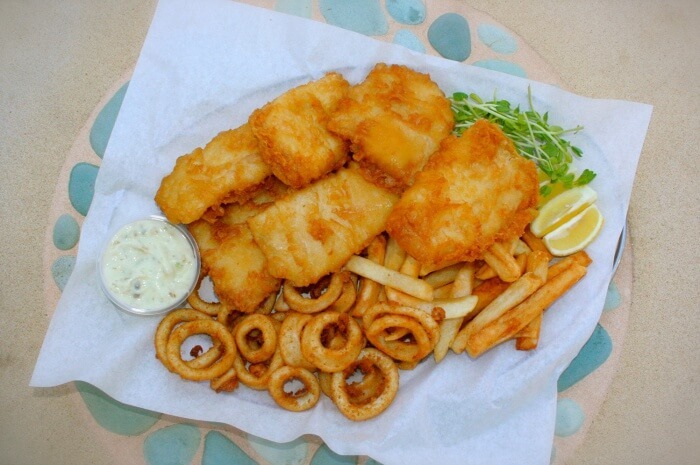 Amberjacks is the best place to eat some of the best Cottesloe Fish and Chips. Being a boutique fish and chips shop, it is a favourite with the locals and the tourists. You can choose to take a table either indoors or outdoors and enjoy the views of the famous Cottesloe sunset and of the lush grass. Amberjacks remains open for lunch and dinner all through the summer season and for five days of the week in the winter season. Location: 28/94 Marine Parade, Cottesloe WA 6011, Australia. 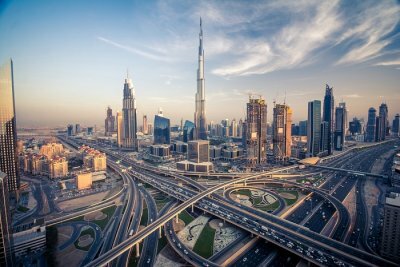 Curious to know where to stay? These places will offer you the best options for soaking in the blissful vibes around this charming beach on your next holiday for sure! The Cottesloe Beach Hotel is one of the best hotels around Cottesloe where tourists can stay during their visit to Perth. It is also home to some of the coolest Cottesloe beach restaurants. The Beach Club of the hotel is a great place to chill with friends while Cott & Co. is a more suave and sophisticated dining place at the hotel. You can grab a couple of drinks and some sumptuous food at both the places or even head over to the Verandah Bar which is right off the beach. The Cottesloe Beach Hotel has thirteen hotel rooms where you can stay on your beach holiday. The hotel has attached private balconies and panoramic views of the beach and the Rottnest Island. One of the best things about staying at the hotel is that you will get a chance to watch the most scenic Cottesloe beach sunset over the beach. Location: 104 Marine Parade, Cottesloe WA 6011, Australia. 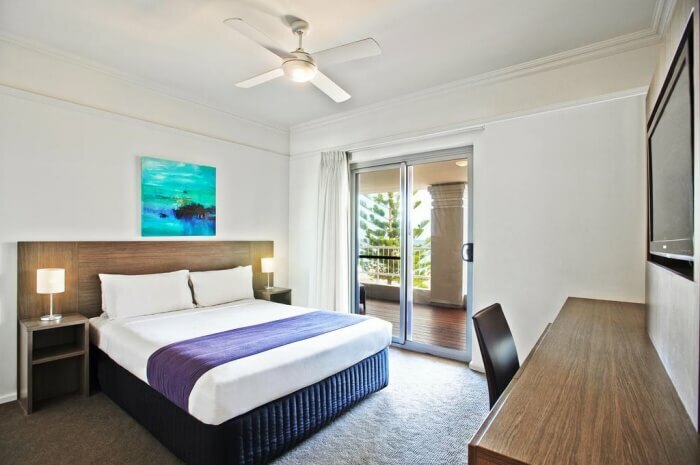 Cottesloe Beach House Stays are now known as Executive Escapes and offer some of the best stay options for tourists, just by Cottesloe, Perth’s beachside suburb. Guests can choose from one-bedroom apartments to luxury beachfront villas or even five bedroom family houses for guests travelling with family. Location: 19 Charles St, South Perth WA 6151, Australia. 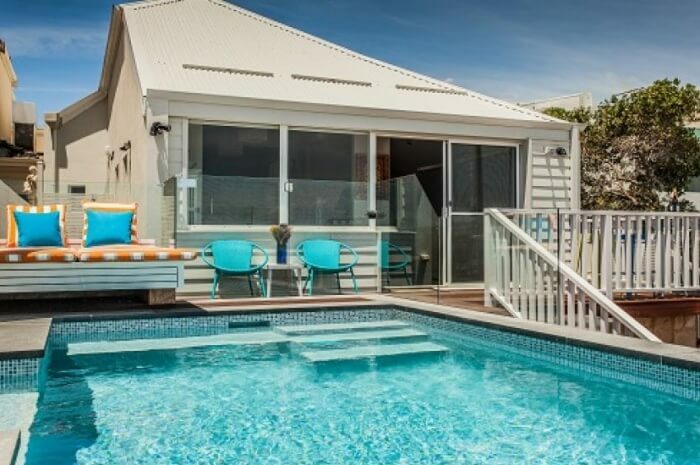 The Cottesloe Beach Chalets are hardly a minute away from the main Cottesloe beach, making it the perfect stay option for a short-term beach holiday or trip. Guests can choose from bedroom chalets, bedroom apartments, beachfront chalets or a regular standard chalet. 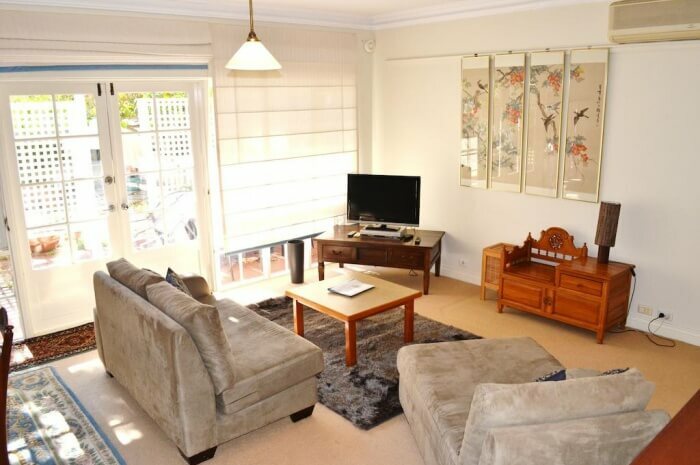 The rooms at the beach Cottesloe Beach Chalets are very clean, tidy and very spacious. The staff at the Cottesloe Chalets is very professional and friendly, making it a great stay option for tourists. Location: 6 John St, Cottesloe WA 6011, Australia. Cottesloe Beach is located midway between Fremantle and Perth, at an approximate distance of fourteen kilometres (30 minutes) from Perth. 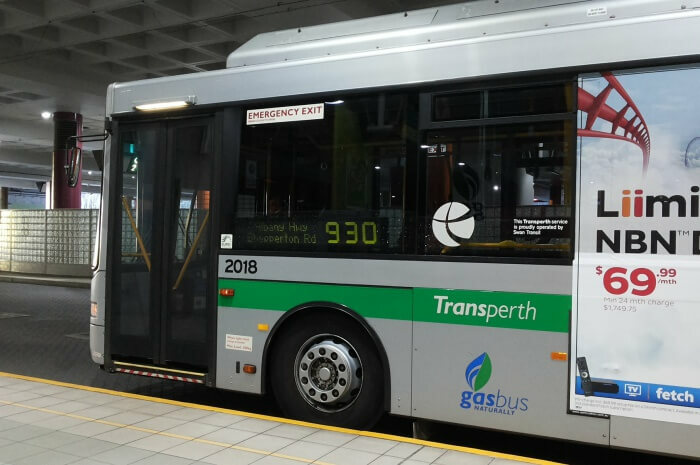 You can either take a bus that you can board from Perth’s Elizabeth Quay Bus Station or choose to go by train that runs from the Perth Railway Station to the Cottesloe Railway station. If you are running short of time, we would suggest you take the train as there are trains every fifteen minutes and will reach you to Cottesloe Beach in less than 20 minutes. From the station, you can walk it down to the beach, the distance is only about 600 metres. 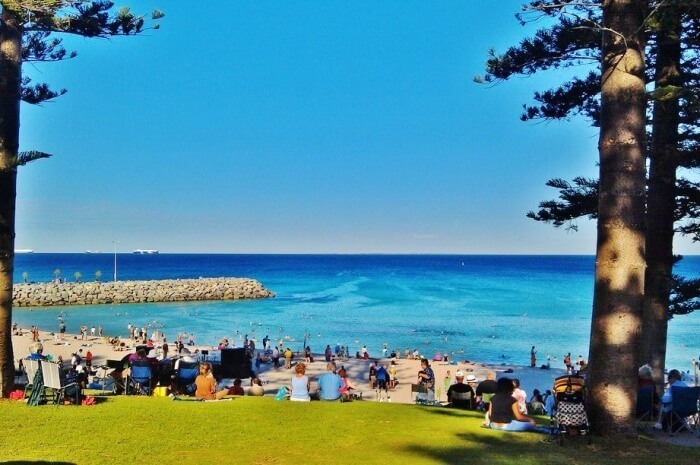 If you are travelling by a private car, you would have to head earlier in the day and ideally choose a working day if you want to park at Cottesloe beach. On weekends and on off-days, it is extremely difficult to find parking at this beach is one of the most visited beaches in Western Australia. 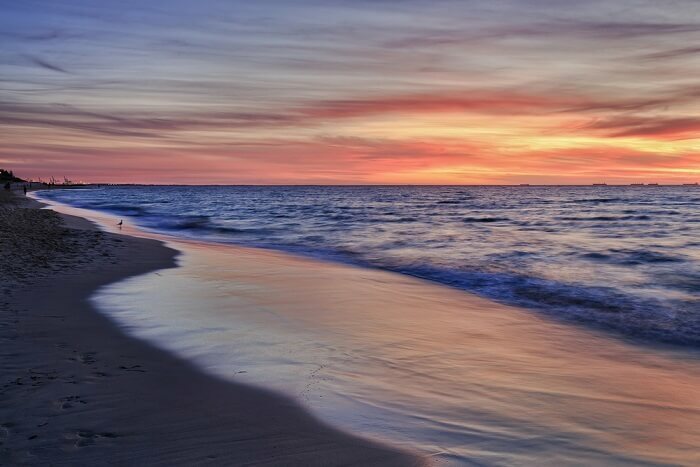 Cottlesloe is one of the finest beaches in Perth, Western Australia and there are lots of reasons as to why. Whether you are travelling for business, pleasure or even for an educational trip, a visit to the beach is sure to rejuvenate all your senses, giving you a plethora of things that you can do and see, all at one place- the Cott Beach! So, plan your trip to Australia and experience the soothing vibes around this beach with your loved ones!